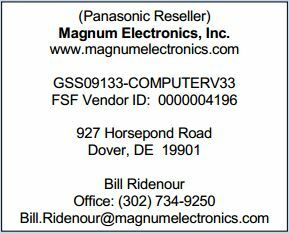 Delaware WSCA Contract Pricing for Panasonic Computers Now Available | Magnum Electronics, Inc. This entry was posted in Company News, Mobile Computers and tagged Delaware, Dover, firefighters, Magnum, Panasonic, police, Toughbook, Toughpad by magnumelectronics. Bookmark the permalink.